* Discover which machines are suited to your particular job. I made a very early start with cutting the grass as you can see. The precision of those early reel mowers is still to be admired. Yet, there are now several new breeds of machine to help tackle your lawns. The question is:- what is the best mowing machine for your lawn's condition? Below I examine how the available types of lawn mower suit your particular mowing job along with their innovations and my recommendations. What kind of lawn maintenance do you do? Find out which type of lawn mower suits you. Below you can match your type of lawn to a suitable lawn mowing machine. 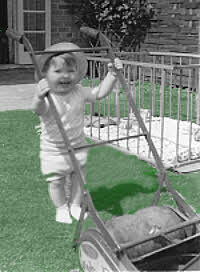 And for each type the practicalities of particular lawn mowers are described. Your Lawn - what kind of grass do you maintain? Rollers that make a lawn nap with stripe effect. Rear grass collection boxes allow mowing close to edge. also – wheel barrow with side extensions for grass collection. Powered travel is a definite advantage. A smaller model with narrow cutting width may be useful here. Wheeled rotary lawn mowers are large and hard to manoeuvre - but click to check the exceptional Gardena Easimove Rotary Mower. A steering wheel controls front wheels and pivots on the machine so, when turning, you don't swing out behind machine - you walk easily along the mowed track. Ride-On mowers are highly manoeuvrable too. Narrow cutting widths are available. Small light mowers are preferable. Robotic mowers keep your grass cut when you're away on holiday. Robotic mowers with open air docking and charging station as well as perimeter navigation cables. Every organic gardener should have one but they are pricey. For power lawn mowers choose petrol (or gas) driven. Petrol / gas driven lawn mowers require more maintenance but it's probably a better investment for a heavy duty machine. Modern lawn mowers combine age-old design with innovation. So now let's look at the main designs one by one. There are many reasons why you may not feel able to walk behind an ordinary lawn mower. And for large lawns or for sloping ground the ride-on-lawn mower goes from being a luxury to a necessity. Hydrostatic drives are a big advance on jerky clutches and gears. They work by pumping oil to two drive motors. This enables the so-called zero turn because you have continuously variable control over both wheels forward and backward. You also get high power output at slow speeds - where a gas engine relying on clutch and gears tends to stall. My retired uncle used one of these around his home in Scotland even though his lawn area was little more than average. He had space in a garage to store it, but if your household boasts a car or two you probably won't find these machines to be too big a deal. Find Ride-On Mowers here - plus machine covers. Would you like to forget about mowing your lawn? You can if you leave the job to a smart robot. Remarkably the RM400 cut height ranges from ¾ inch (20mm) to 3inch (80mm). And it can be programmed to cut at night if need be. But you can set it to stop cutting when it rains. These lawn mowers keep the grass cut for you when you are on holiday. (An anti-theft device is included). You may even save on having a regular gardener. The above two options are gaining ground as gardening becomes more popular. You can check whether a robotic mower suites your style on this link. Many gardeners enjoy the walk behind a lawn mower on a nice summer's day outdoors. But you need the right lawn mower for your grass to experience this pleasurable exercise to the full. Heavy duty rotary mowers are capable of razing woody saplings and brambles to the ground. You can wade into rough areas of thistles or nettles and leave a clear path behind. Organic gardeners can throw leaves and cut weeds onto the lawn and a rotary mower will cut, shred and bag it ready mixed with the lawn cuttings. Rotary mowers have 4 side-wheels, or 2 wheels and a rear roller for striping fine lawns. Under certain conditions wheeled mowers may leave tracks. This is temporary, and can be reduced with height adjustable rotating blades to lower the cut. Find rotary mowers from this link. The Gardena Easymove is described below. They've added what looks like a steering column that pivots to allow the gardener to walk behind in the track of the machine. So that beats swinging out behind the machine when you want to turn and solves a real problem when mowing near edges. So the Gardena Easymove is the rotary mower for curvy edged lawns. Rotary blades are modified to shred the grass very finely and deposit the fragments back on the lawn. This fine mulch breaks down quickly to feed the lawn and save on additional fertilizer by recycling nutrients. The option to collect cuttings into a grass box when needed is useful for early and late season cuts. This reduces risk of fungal disease outbreak and collects your cuttings to use elsewhere as mulch. Find Mulch Mowers here. This traditional design is the best choice to cut high quality fine lawns. Their rollers add a professional looking stripe finish. And now specialised cassettes can change cutting blades for aerating, de-thatching and scarifying tools. These machines are precision engineered masterpieces. FRONT ROLLERS: A light roller precedes the blades and is adjusted to set the cutting height. COMBS: A row of vertical bars behind the front roller comb the grass into an upright stand in preparation for cutting. They are found on top-class Atco cylinder mowers and other professional lawn mowers. First class lawn mowers allow you to remove the cutting gear with a cassette and then add-in lawn aerators, de-thatching and scarifying tool cassettes. After setting blades test for a clean cut using a grass leaf at several points across the span. The number of blades, rate of rotation, and the speed of travel, are important. The finest cuts are obtained from motorised machines with 10 or 12 moving blades. They are essential for the uniform grass pitches of bowling, croquet and putting greens. Reel mowers with few blades and moving quickly, leave gaps between successive cuts that may appear as ridges. However, these are easily removed by cross mowing which is also recommended for the most uniform of finishes. However, motorised lawn mower blades that rotate independently of travel will give fine cuts, especially when travelling slowly. GRASS THROW: After cylinder blades cut the grass they sweep the cuttings back. Behind, a deflector plate turns the grass / air flume over the top of the cylinder and forward into the grass box. The Atco machines have parallel vanes on the deflector to reduce turbulence and channel a powerful air stream. MAIN ROLLERS: Behind is a larger roller that bends the lawn grass to give the professional striping effect. Differential rollers i.e. 2 rollers side by side, allow lawn mowers to turn more easily. Ridged rollers give better traction on slippy damp grass and on slopes. SIDE-WHEEL ADAPTATION: Cylinder mowers are usually limited to use on short fine lawns. Yet a further modification in some Atco mowers and others, adds side-wheels. This raises the lawn mower and enables cutting of longer grass - great for organic gardeners who appreciate fine lawns but sometimes need longer grass too. These side-wheels also permit travel over hard rough surfaces without damage to the rollers. Atco / Qualcast bring the professional mowing technology to the domestic gardener. Hover mowers are suited to uneven lawns, with difficult turns and spaces as well as sloping sites and embankments. They will glide over paving stones where they are included in lawns and overlap edges. The smallest hover mowers exploit the strengths of this design as they are light and highly manoeuvrable. Smaller models are not able to collect grass cuttings. Qualcast calculate that the extra weight of a grass collecting bag requires heavier motors and that makes the machine less efficient all around. But if you want a light, portable and manoeuvrable machine choose a small hover mower. Cutting height on many hovers is less precise compared to adjustment on other designs. In my experience, hover mowers are not good at tackling very short grass on fine lawns. For one thing, grass is somewhat flattened by the airflow (bear this in mind with advertised 1cm min. cutting heights). Hover mowers can increase problems in moss laden lawns in the U.K. The tough springy so called ‘fly-mow moss’ Rhtydiadelphus squarrosus is pushed beneath the blade by the air flow but the grass gets cut. The result - moss overpowers grass. Hover mowers share some attributes of rotary mowers: they may vacuum excess debris from a fine lawn surface; and they make a circular cut that doesn't align or stripe the nap. Unlike rotary mowers they can't be used to mix leaves with grass cuttings and bag it because the machine looses hover power when blade rotation slows. Some hover lawn mowers have a single metal blade like a rotary mower. Others have light plastic blades that are replaceable and sold in packs. Hover mowers can be found from this link. These lawn mowers are light and portable. With a rear mounted grass box they cut right up to edges. This design solves problems at boundaries with lawn-hedge, lawn-wall or lawn-tall flower boundaries. Typically they have 4 or 5 moving blades. And with no front roller to flatten grass before the blade arrives, they also cope with grass that's a little longer. Mine is the push mower version. I run along borders with the left wheel over the edge. The right wheel drives the blades. No messing with cables or engine oil saves me time and that's a real encouragement to get on with the job. And on small town lawns it's a simple run around. Some of these designs suffer on uneven lawns from rocking front to back. But for short and regular cuts you can leave the grass box off. The quiet nature of a push mower is a big attraction too. Because in the suburbs machine noise echoes and amplifies from all the buildings around. And our quiet neighbourhood begins to sound more like a busy airport during summer weekends. So if you're really set on getting a power driven machine for small lawns, please choose a low power quiet model. Compact reel mowers are available with small motors. But the manual version is more practical. Find a light compact mower here. Note that compact mowers throw grass cuttings backwards without a deflector plate. Sometimes the grass flume can be thrown to one side. But the box on the Gardena reel mower runs wide on one side to the catch grass throw. It is designed to fit several different mowers. Compare with this selection powered mowers. Robotic Mowers available on this link. - rotary, cylinder, hover, and light compact machines, can be found on these links. Try the Bosche Ergoflex instead - special combs allow mowing up to the edge. Ride-On Mowers are here for big gardens and an easy life.